From aggressive hand-to-hand combat, to shooting in extreme climates in the desert and snow-capped mountains, to battling a pack of ferocious wild wolves, to the weapons and military vehicles, Tiger Zinda Hai is set to be an amazing action thriller. 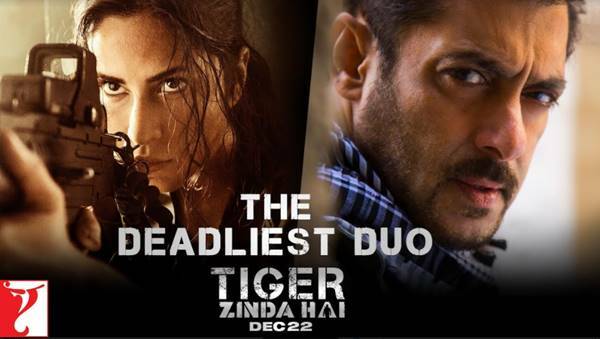 The mega action entertainer’s lead pair – superstar Salman Khan and Katrina Kaif – have pushed themselves to their limits to pull off never-seen-before, death-defying action stunts. Though Salman has done some amazing action sequences in the past, he has upped the ante for Tiger Zinda Hai. Katrina, who has not done nearly as many challenging sequences, has really pushed herself and the envelope on action for this film. She has been part of nerve-wrecking car chase sequences – one of which led to a huge accident but she escaped unhurt thanks to security checks in place. She has trained in sword fighting and parkour through which she takes down an army of enemies. She underwent heavy-duty weaponry training for a month to look convincing when using them on screen. The high-octane Tiger Zinda Hai is set to release on Friday. Check out this video to get a sneak peek! 16 queries in 0.643 seconds.